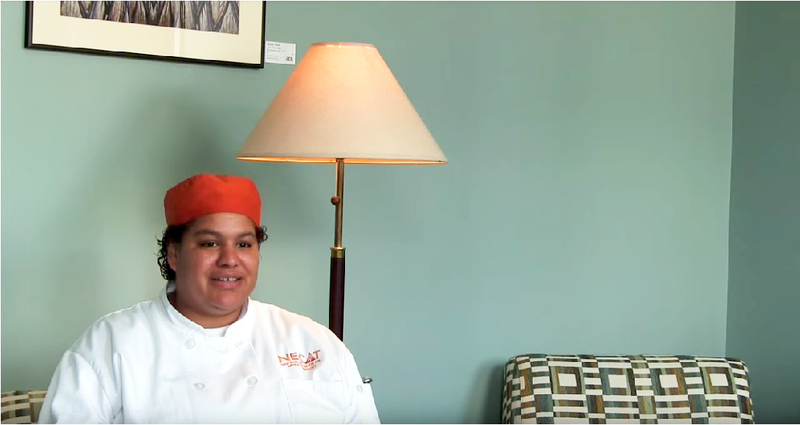 Once enrolled as a student at NECAT, you will receive the training and support you need to launch your culinary career. But, your journey with us doesn't end there. Program graduates are encouraged to continue accessing our employment and support services for the first few years of their careers. We are thrilled that you have decided to invest in your future by enrolling in our Culinary Arts Job Training Program! As you know, NECAT students are expected to take on a lot of responsibilities during their time in the program, which include showing up every day, participating and volunteering, committing to your education, and working with us to get you a great job in the culinary field once you graduate. Here are a couple important notes for helping you succeed at NECAT. All students must achieve at least an 85% on-time attendance rate, meaning arriving at NECAT, in full uniform, before 9:00 am for lineup and staying until class is dismissed at 3:00. It also means fully participating, whether it’s in the classroom, cooking in the kitchen or helping with cleanup. Anytime you expect to be late or absent, you should contact Student Services or your Chef Instructor as soon as you can. Although we do not charge tuition, all students are required to pay a $200 fee to cover a portion of the cost of student supplies (textbooks, uniforms, knife kits, food, etc). Click here to make a credit card payment toward your fee (full or partial payments accepted) or bring cash or check with you to NECAT. Only $40 is required to be turned in before you start class. NECAT follows the Boston Public Schools closing schedule and all closings are posted on our Facebook page. NECAT has a powerful network of hundreds of alumni across the Boston area. It’s important to us that we continue supporting our graduates, working with them to achieve their long-term goals. If you want any assistance with updating your resume, finding a new job or joining our Student Leadership Council, please get in touch. You are always welcome to come to one of our Career Fairs, held at our Boston Center every two months. Click here to update your contact info, your employment info, or to get in touch with our Career Services staff. Still have questions about NECAT? Please don’t hesitate to contact us. Fill out the contact form with your name and message, and we’ll get back to you as soon as possible.